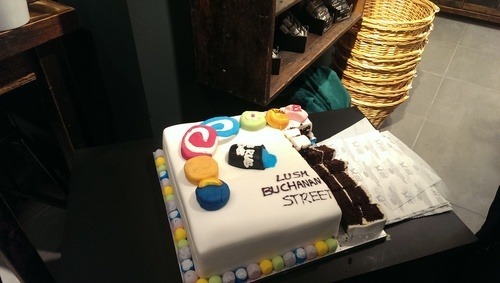 Last week I attended the opening launch party night at the re-vamped Lush store on Buchanan Street in Glasgow. It looks amazing, and I love the strong use of wood inside. 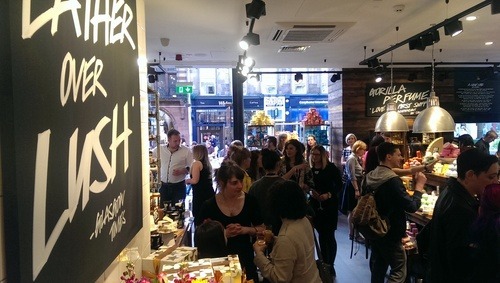 The night began with drinks, canapes, cake and a chat with my blogger friends, before we were shown one of the spa treatments- ‘The Comforter’- that they offer in their Edinburgh Lush Spa (and in their other UK spas). I’m going for their ‘Hard Days Night’ treatment in just under two weeks, and I can’t wait. 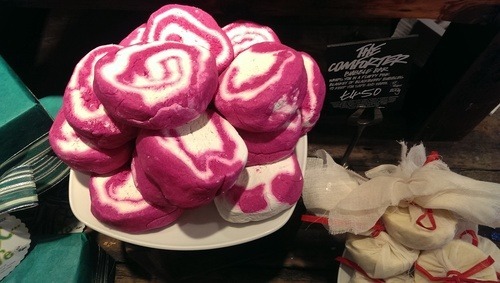 I also got to make my own The Comforter bubble bar (blackberry scented). Mine didn’t look as good as the ones on sale- it’s a lot harder than it looks to get the swirl just right. 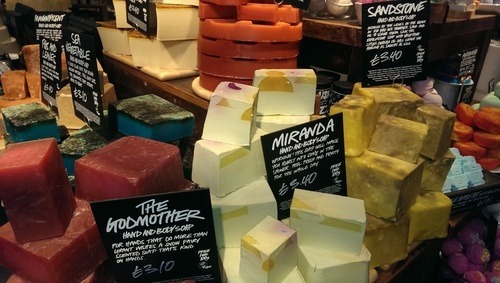 I love so many Lush products, and it’s so hard to be in a store with all the gorgeous smells, and not want to take everything with you. We got to find out all about the new releases for Summer, and bring them home to test. 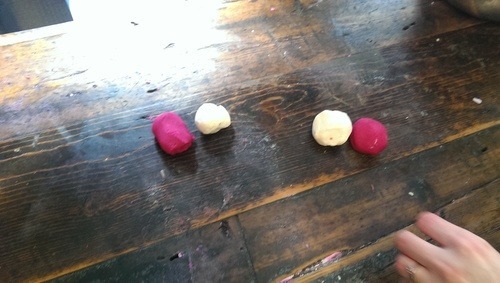 I’ve been using them all weekend and I love them; especially the D-Fluff Strawberry Shaving Soap (£5.75). It’s a shaving foam that smells of yummy strawberry and marshmallows, and has made the monotony of shaving my legs this weekend much more enjoyable. Another of the new releases is the Zest Hair Gelly (£11.25)- a citrus-scented hair gel that’s great for creating messy beach hair. 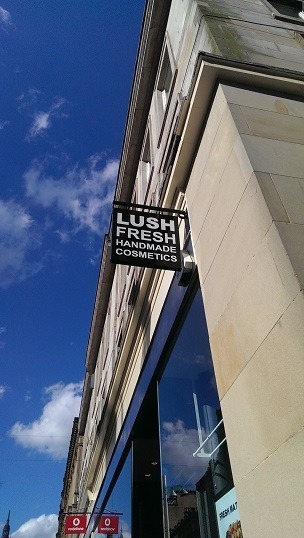 It doesn’t weigh your hair down, or make it all sticky like some gels do. 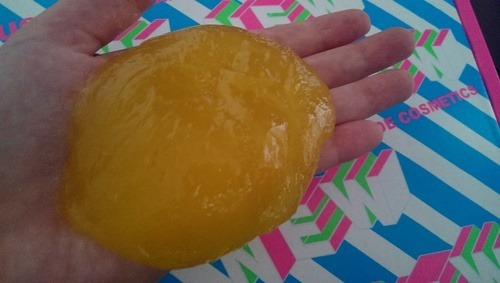 It comes solid like the shower jellies, and melts slightly between your palms. You then just pop the rest back in the pot. I also really like the new Granny Takes A Dip bath ballistic (£3.25). 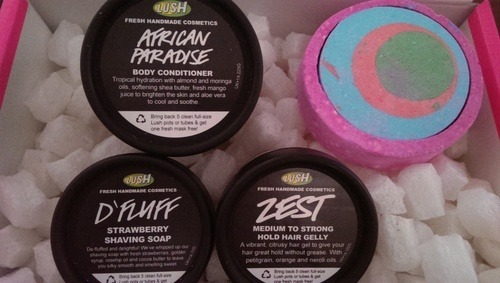 Its bright colours are so Summery, and made my bath yesterday such fun. It has an unusual scent of ginger, lemon and black pepper. On reading the description, I didn’t think i’d like it and that it would be too overpowering; but the scent is subtle and quite comforting. 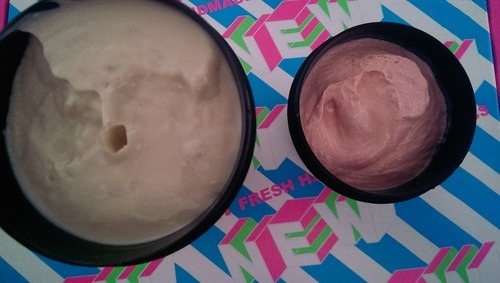 Also new is the African Paradise body conditioner (£19.25)- basically an in-shower body moisturiser. I can never be bothered with body lotions most of the time- rubbing them in etc; so this is a great quick way to condition your skin. It smells very relaxing (with moringa oil, ylang ylang and aloe vera), and feels lovely and buttery.